I was so excited when I saw the vegan options that Harvester had added to their menu. I couldn’t wait to go and check them out. I was on a bit of a mission because I knew they were available for a short time. After I was seated, I realised that they had two menus. Their main menu showed existing vegan options i.e. those that were here to stay, and they had a temporary menu as well. The latter included the limited edition options that were specifically launched for Veganuary. I opted to order the temporary dishes, so that I could try them before they were taken off the menu. However, although it was seven or more days after the launch of these options, the branch we went to, still didn’t have the items. From what I recall, they didn’t have the Purist Burger or any of the desserts! After a bit of toing and froing, it was confirmed that although they had 14 burgers earlier that week, they couldn‘t find any of them and they were struggling to accept that they’d been sold out. They also told us that they have had issues with the suppliers and that a number of branches haven’t received the new options. We ordered the Nachos, Beyond Bean Burger and the Peri-Peri Tofu Skewers. Of the three items, the only item which wasn’t on the main menu, was the burger. The nachos and skewers were on the regular menu. I gave them the benefit of the doubt and hoped that the issues with the suppliers would be rectified by now. We visited our local branch again, but this time, we called in advance to check that they had the options that were on the limited edition menu. We were told that there was lots of everything in at the moment, but they couldn’t be sure that the options would be available when we arrived. We thought we would have good chance of being able to order what we wanted because the phone call was made a few hours before we popped in. We ordered the Purist Burger, the Jamaican-Style Katsu Curry, the Blackcurrant Mousse and the Chocolate slice. Unfortunately, we tucked into the burger and realised it was the bean burger and not the one we ordered. Apparently, the kitchen had run out, so (without confirming that we were happy with the substitution), they decided to send us the bean one instead. 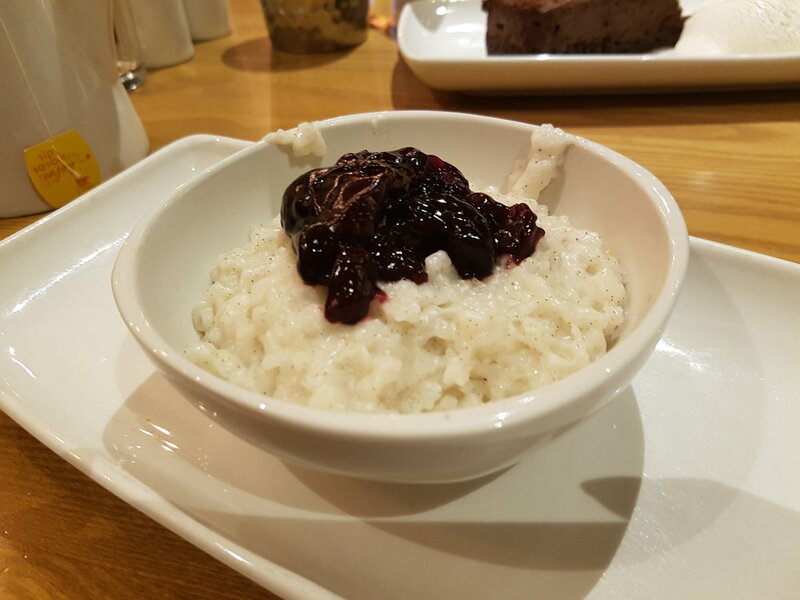 We were later told that they didn’t have the Blackcurrant Mousse either, so we opted for the Coconut & Black Cherry Rice Pudding. Again, we were told that there was an issue with the supplier. One member of staff told us that Harvester often launches menus but their suppliers aren’t ready or able to deliver what’s needed, and that results in the waiting staff having to let customers down. This is particularly difficult when customers have come in, specifically, to try newly launched items. I’m not usually a huge fan of peas but there was something about the Kickin’ Peas. They were delicious, as was the tofu. The bean burger was nice and both desserts were lovely. I enjoyed parts of the curry but wasn’t keen on some of the breaded vegetables, and I’m not sure why. I was thinking that it wasn’t great that we had reached the middle of January, and the items which were meant to be for a limited time, still weren’t available. However, Harvester have decided to add the options to their menu permanently, so hopefully, you’ll have better luck with trying them, than I did!